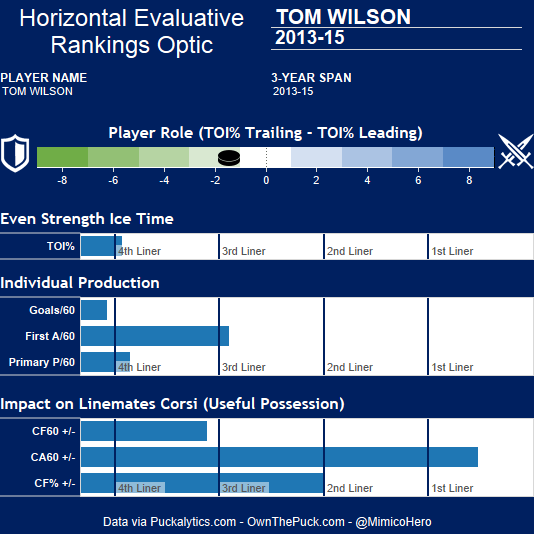 What Should We Make of Tom Wilson? It has been no secret that this is an important season for the Washington Capitals. The acquisitions of T.J. Oshie and Justin Williams, along with the continued developments of Andre Burakovsky and Evgeny Kuznetsov, have made this rendition the most exciting hockey team the district should see in over three years. Yet, as the added individual skill has increased through last summer’s acquisitions, there are those that fit the grittier side to Washington’s game that will be missing this upcoming season. Gone are such types like Troy Brouwer and Joel Ward that gave Washington such a different dynamic to winning hockey games. As a result, this is where Tom Wilson comes into the spotlight. It’s almost like yesterday that the former Plymouth Whaler was the 18th overall pick in the 2012 NHL Entry Draft. With the size, goal-scoring numbers and willingness to drop the mittens, Wilson was one of many to be considered “The next Milan Lucic” before he set foot on an NHL ice rink. Despite being placed in such high regard, Wilson certainly hasn’t produced like Lucic just yet and for some, that is considered a failed NHL career already. After finishing his age-20 season, he has played 149 career regular season games, yet has only produced seven goals and 27 points. With the same amount of career games during the same development period, Lucic racked up 25 goals and 69 points. This included the winger’s breakout 2008-09 season where he put up 17 goals and 42 points in 72 games. One thing to take note of such a comparison is the reminder than Lucic was a second round pick in the 2006 NHL Entry Draft. During this stage of the draft, the chances of making into the NHL are nowhere near as strong as that of a top-10 pick, let alone one within the first round of a draft. When you get NHL equivalencies involved, Lucic’s numbers didn’t translate to someone that could produce well at the highest level. For proof, his cumulative NHLe point-per-game rates for his draft year and draft+1 year wer 0.092 and 0.198, respectively. The same could be said for Wilson where his draft and draft+1 seasons produced cumulative NHLe scoring rates of 0.165 and 0.263 points per game, respectively. Wilson had the better junior numbers, but they were not at a level where you could pin the future Capital as a guaranteed top-six forward. While Wilson has experienced favorable zone starts and competition for him to generate offense, he has one of the worst shooting percentages in the entire league. Some will argue that shooting more times in much more advantageous areas will help out Wilson’s goal-scoring ability, but he is actually about as even as the shooting numbers Lucic has produced throughout his career. On a per-60 minute basis at even strength from war-on-ice.com, Lucic has usually puts up 9.9 total shot attempts, with 2.5 coming from high-danger scoring areas and 6.09 coming from overall scoring chance regions. Of Wilson’s 9.65 shot attempts per 60 minutes, 2.63 of them are in those high-danger areas and 5.23 of them are from overall scoring chance areas. Along with that, sportingcharts.com records shot type and location data for all NHL players. By percentage of all the shots that are of the net-crashing variety (backhanded attempts, tip-ins, deflections and wrap-arounds), Wilson currently stands at 23.4 percent while Lucic is at only 13.4 percent. So some of Wilson’s bad shooting numbers may lead to just plain bad luck and more NHL game experience will lead to his on-ice luck to turning around. However, what can be said about Wilson is that his three major shot types (his wrist, snap and slap shots) need to be much more deadlier as his career continues. As a result of such circumstances, Lucic has been on plenty of scoring lines during many of Boston’s Stanley Cup quests. Wilson is still struggling to find the appropriate set of teammates to give him an identity as an NHL player. That all being said, this all has not been the fault of his own for not living up to such potential. Wilson made it to the big club a year too fast in the 2013-14 season under the failed Adam Oates regime. The former head coach’s systems were a failure for so many reasons, but among them was not trusting the younger players to develop a role on the team and be able to get the necessary playing time to be counted upon in big-game situations. For Wilson, his time on ice was barely above seven minutes a night during his rookie season. Under Barry Trotz, his minutes slightly improved, including receiving playing time with Alex Ovechkin and Nicklas Backstrom on Washington’s top line. However, Wilson found himself playing a fourth-line role again come Washington’s most recent playoff run and was still labeled more as a person that wanted to fight rather than play a strong possession game. With many of Washington’s dependable penalty killing forwards from last year’s team gone, Wilson has a chance to play in that role this season. At even strength, Wilson’s on-ice shot suppression is actually considered top-line quality according to Dominic Galimini’s HERO charts. However, there is one other player that better compares with Wilson’s attributes than Milan Lucic. In the latest edition of Historical Player Projections by Rob Vollman and Matt Cane, Kyle Clifford’s age-22 and -23 seasons popped up when predicting Wilson’s point totals. When you look at Clifford’s HERO chart and his career point totals in juniors and in his first two years in the NHL, it is scary how much symmetry exists between him and Wilson. 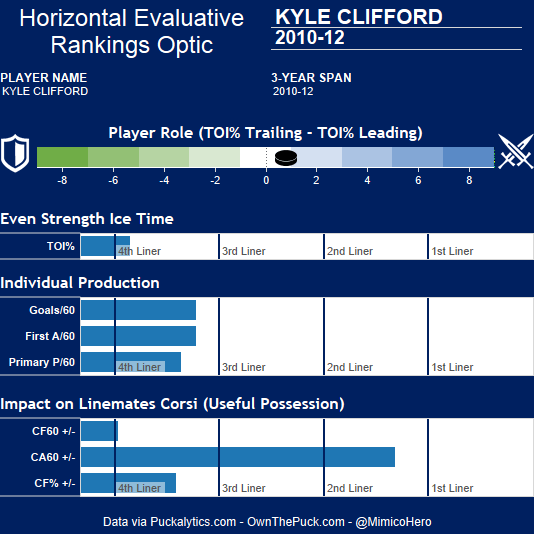 However, that doesn’t mean Clifford has a true special teams role with the Kings. In his career, Clifford has averaged less than 11 seconds on the penalty kill and nine seconds on the power play per game. As the fourth-line forward will be turning 25 this season, Clifford’s chances to develop into anything more than what he is are beginning to decrease. Wilson still has time, but time is always precious. If for anything else, this exercise is to prove how uncertain projecting young players is and yet how vital it is for general managers to get a true grasp on their development in the analytics era of the NHL. For Wilson’s case, he will be a restricted free agent after this season. He is not a failure in the sense that he has played the fifth-most games out of any player in his draft class, but he is now at a point where his role must be defined this season. He is guaranteed to have a better chance of finding that role this season, but he will be experiencing higher expectations than he has ever felt in his young NHL career. He was promoted to the NHL too soon, but he was also a former first round pick expected to overcome such challenges. No matter what side of the coin you are on in this debate, this will be the most important season in Wilson’s career and questions will have to start getting answered.